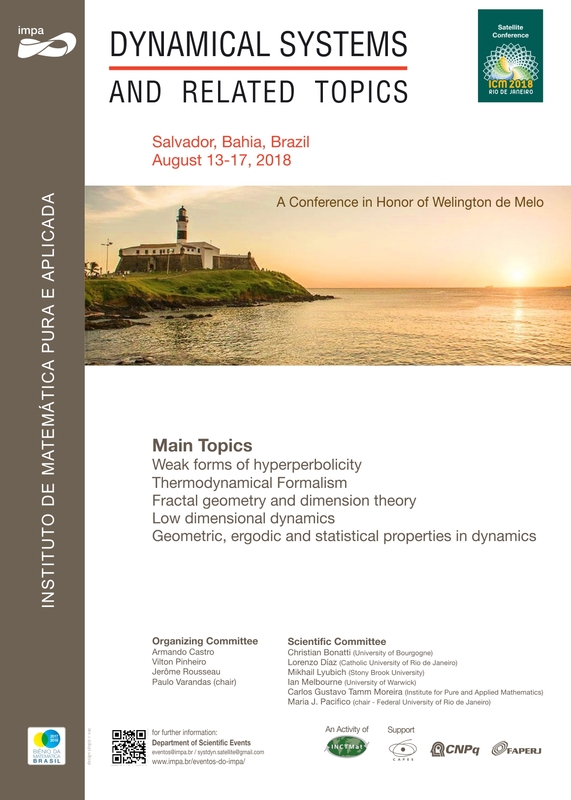 I received my PhD in Dynamical Systems from the International School for Advanced Studies (SISSA) in Trieste and the Instituto de Matematica Pura e Aplicada (IMPA) in Rio de Janeiro, under the supervision of Marcelo Viana an Jacob Palis in 1995. I was a postdoc at the Mathematics Institute at Warwick University from 1995 to 1999 and a lecturer, senior lecturer and reader from 2000 at Imperial College London where I co-founded the Dynamical Systems group DynamIC. In 2009 I had the privilege of moving to the Abdus Salam International Centre for Theoretical Physics (ICTP) in Trieste where I coordinate the activities in Dynamical Systems and Ergodic Theory within the Mathematics Section. My research is in the area of Dynamical Systems and Ergodic Theory or more specifically in the "Stochastic properties of deterministic dynamical systems". This has to do with the fact that many dynamical systems are "chaotic" in the sense that their short term behaviour is quite unpredictable but statistically well behaved, which allows us to have fairly reliable long-term statistical information and predictions. I am also involved in the organisation of many schools and workshop both in Trieste and elsewhere, including in developing countries, and of supporting mathematicians working with few resources and difficult conditions. Anyone interested in visiting and lecturing in a developing country is invited to contact me to discuss opportunities. This is an INFORMAL (and INCOMPLETE) calendar of events related to Dynamical Systems worldwide. You can access and subscribe to the full calendar through the link below. If you would like to add your event to the calendar please send me the information, possibly as a .ical calendar file. Tarbiat Modares University, Tehran Iran. School in Dynamical Systems, ICTP, Trieste, Italy. School in Dynamical Systems, Kathmandu, Nepal.